Some fascinating facts about trout. Brown trout (including sea trout) belong to a single, polytypic, species. They are, however, so variable and adaptable that attempts have been made to assign them to at least 50 separate species. Brown trout are one of the most genetically diverse vertebrates known. There is far more genetic variation present across British populations of wild brown trout than between any populations in the entire human race. Brown trout have between 38 and 42 pairs of chromosomes. Humans have only 23 pairs. Genetically different trout are capable of spawning together and producing viable offspring but many have remained distinct for thousands of years. This happens because they have different life strategies e.g. their choice of spawning locations and timing or adaptations to exploit different niches within the food chain. Large trout can eat large prey. For example, it is thought that large New Zealand trout feed on the periodic plagues of mice. Rainbow and brown trout do not interbreed in the wild although ‘brownbows’ have been produced on fish farms. Rainbow trout Oncorhynchus mykiss and brown trout Salmo trutta are in the same family (the Salmonidae) but are different species in different genera. They have the same ancestors but divided into two groups around 15-20 million years ago. Oncorhynchus became isolated in the North Pacific and Salmo in the North Atlantic. A typical female brown trout produces about 2,000 eggs per kilogram (900 eggs per pound) of body weight at spawning. Brown trout can reach the ripe old age of 20 years. Freshwater forms of brown trout that migrate from lakes into rivers or streams to spawn and known as ‘potamodromous’. Grayling and trout occupy subtly different habitat niches and will readily co-exist in the same stretch of river. They may both, for example, eat a common food item (e.g. shrimps) but that does not necessarily mean they are competing with each other. In a Scottish loch, higher numbers of trout usually mean a smaller average size & weight of trout. In certain locations & habitat types, brown trout generally become more piscivorous at a size of 20-25cm. In some lakes & lochs, wave action and a pebble substrate can provide trout with spawning habitat on the wind-swept shorelines. In the River Tweed, studies during the late 1980s/early 90s suggested a high rate of interbreeding between the salmon & trout with 4-5% of juvenile fish proving to be trout/salmon hybrids. Large brown trout will also feed on small terrestrial animals that fall into the water, such as baby birds falling from overhanging nests, or even swimming mice or voles. 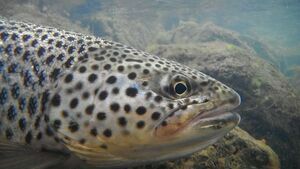 Many so-called ‘resident’ brown trout do undertake migrations. They may be of a lesser extent than sea-trout, but they move up and down river and sometimes in and out of lakes at various times during their lives, for spawning, feeding and shelter. Salmon and trout can interbreed and do produce hybrids. The fecundity (reproductive potential - fertility) of female trout generally increases with size but decreases in large, old fish. The majority of trout die before their first birthday. Mortality rates in their first year of life are typically 95% or greater, falling to around 40 - 60% in subsequent years. There is strong evidence that trout can detect polarisation of light, which helps them locate prey which is otherwise difficult lacking stereoscopic vision (eyes either side of the head). 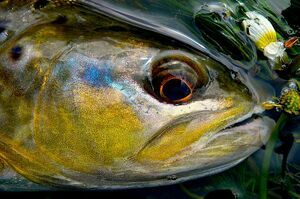 Trout can rapidly change colour, getting darker when being aggressive, lighter when being submissive or in response to changing background colour. Trout don’t have scales for the first month of their life. Trout have body language. When competing for a ‘lie’ they will posture and ‘gape’ by opening their mouths wide and flaring the gills whilst advancing on their opponent. Fighting is kept to a minimum. Submissive fish close their mouth, contract their fins, go pallid and drop towards the stream bed. Trout have teeth on the roof of the mouth called vomerine teeth, and this helps to distinguish trout from salmon. In trout the teeth are a strong double row; in adult salmon in freshwater, they are small and a single row or absent. 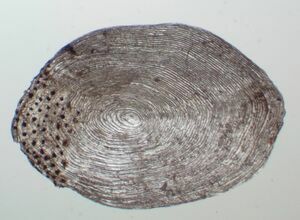 Trout scales have growth rings, as new hard tissue is added around the edges as they grow. They can be read just like growth rings in a tree. Trout select mates to prevent in-breeding and to give offspring desirable traits like disease resistance. They do this via olfactory and visual clues. Trout, like most other fish, cannot regulate their body temperature – they tick over at the same temperature as the water in which they swim. The temperature tolerance levels of trout range between a couple of degrees up to around 25°C. However, trout will be uncomfortable in water above about 20°C. A 41.45lb (18.80kg) brown trout was caught by Tom Healy on Sept. 11, 2009 in the Manistee River system in Michigan, setting a new all-tackle world record for the species. The British record rod caught wild brown trout is 31lbs 12oz (14.4kg) caught on Loch Awe by Brian Rutland. The largest subspecies of S. trutta is the Caspian trout, reported to weigh up to a massive 51kg. The record rod caught sea trout was caught off Calshot Spit in the Solent by J. Farrent. It weighed 28lbs 5oz (12.85kg). Wild brown trout do grow very large. A 31kg trout was netted in Lake Maggiore, Switzerland in 1928. 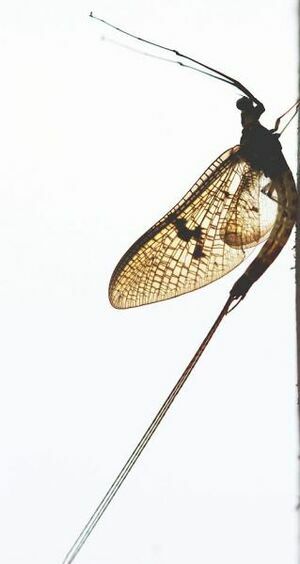 ‘Duffers fortnight’ refers to a period in the Spring when the mass hatching of the mayfly Ephemera danica can trigger a feeding frenzy in trout and any old duffer can catch the fish! All fishermen know that trout get progressively larger after they have been caught. Analysis of catch returns shows clearly that in most fisheries a large proportion of the catch is taken by a small percentage of anglers. Give a man a fish and he'll eat for a day. Teach him to fly fish and he'll move to New Zealand. How do you tell the difference between a rising trout and a rising grayling? Grayling blow little bubbles when they rise. Trout (usually) don’t. In the Buffalo Ford section of Yellowstone National Park, cutthroat trout have been caught and released on average 9.7 times each. On rivers with a high level of angling pressure, trout become more able to distinguish between any sort of food item that has a piece of nylon attached and one that hasn’t! Research in America has shown that brown trout are harder to catch than rainbow, brook or cutthroat trout. (Behnke ‘About Trout’ 1989). The calm before a storm may be one of the best times to catch fish, including trout. Studies have shown that trout respond to sudden changes to their environment like a rain storm by feeding heavily. The earliest account of flyfishing (AD 200) is by the Roman scholar Aelian who recorded Macedonians ‘cast with rods to speckled fish’. Tickling trout is an old poaching method of feeling for trout underneath undercut river banks and hoisting them out by hand. Trout are apparently unable to distinguish between a fly that arrives in the water following a perfect cast, and one which is cast badly. Trout don’t laugh when they’re being tickled! Trout have a brain about the size of a pea, but are very capable of (apparently) outwitting fishermen most of the time. After the last ice age, the rivers of Britain were populated by wandering sea trout who found empty habitat niches in the newly ice free rivers. Anadromous is used to describe fish that have both fresh and saltwater life stages. Anadromous fishes such as salmon and sea trout spawn in freshwater and migrate to sea as juveniles to grow towards adulthood. Brown trout and sea trout tend to return to their natal areas to spawn. However, small numbers of sea trout will also wander into new territory to spawn with the locals, bringing new genetic material that might be useful in that area. Deciding if a trout is a sea trout or a brown trout can be easy if the sea trout is fresh run from the sea –sea trout are distinctively silvery in colour and may still carry sea lice. However, once they have been in fresh water for a while they return to brown trout colours. They do tend to be much bigger than resident fish. In some sea trout populations, the majority are hen fish. It is thought this is because female fish require the richer marine feeding to produce their eggs, whereas the males can produce sufficient milt (sperm) whilst remaining resident in the river. Large hen fish of both salmon and sea trout may mate with small young males, often called ‘precocious parr’. Sea trout are known by lots of different names. These include: peel, finnock, herling, whitling, sewin, white trout. Some of these are terms mainly used for young trout e.g. a finnock is a sea trout in its first year since becoming a smolt, school peel are small sea trout. Sea trout do not always spawn in their natal streams but will wander into other streams and spawn if they find vacant habitat. This is how trout can naturally populate (or re-populate rivers). How quickly this happens depends on how accessible the ‘empty’ habitat is to trout. 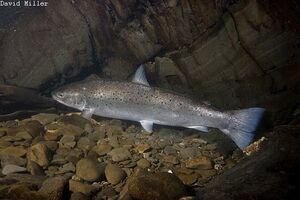 Sea trout generally remain within 80km of their natal river in contrast to salmon which travel much further to various sub-arctic feeding areas. Sea trout live in shoals when smolting and when feeding at sea. They will occupy the same pool as other trout on return to the river, but when spawning begins, they resume their territorial nature. Sea trout smolts move downstream in shoals, drifting tail first in the current. Sea trout undergo amazing physiological changes as they move between fresh and sea water. Special cells in the gills either take in or excrete salts and the fish's kidney adapts either to produce loads of or a little urine dependent on the type of water around the fish. Slob trout feed in estuaries rather than travelling into the open sea. They may be ‘semi-silvered’ or more like brown trout in appearance. The process of ‘smoltification’ is undergone by young trout preparing to go to sea. They change in some amazing ways: for example, they become silvery by producing guanine crystals on their scales, their eyes enlarge and their internal organs adapt to cope with the move from fresh to sea water. Brown trout are not native to North America. They were introduced in the second half of the 19th Century from Germany and the UK. Brown trout have become so well naturalised in some countries that they have out-competed the native fish (for example, in New Zealand). In these cases, they are an invasive species. However, they are of considerable economic importance for sport fishing and tourism. 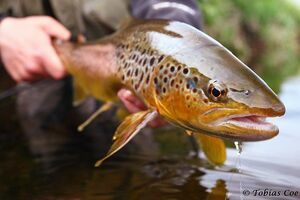 Brown trout have been introduced and naturalised in many countries and regions. These include: Australia, New Zealand, USA, Canada, Sri Lanka, South Africa, Zimbabwe, Malawi, Kenya, Kashmir, Bhutan, Falkland Islands, Chile, Argentina. 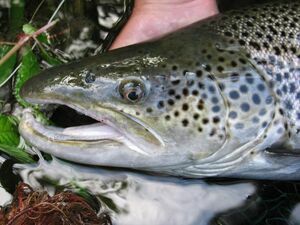 Brown trout were introduced into the southern hemisphere. There are no native ‘Salmo’ species in the southern hemisphere. In North America, brown trout are in places still known as German trout or Loch Leven Trout. 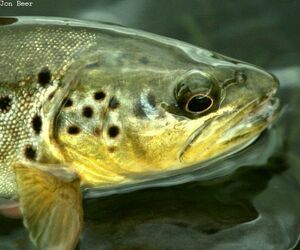 Salmo trutta is one of the most widespread fish in the British Isles. The Mediterranean has no sea trout, but they do occur in the Black and Caspian seas, along much of the Atlantic coast, the Baltic and as far north as the Barents and Kara seas in the Arctic Ocean. The natural range of Salmo trutta extends from Iceland to the Atlas mountains in North Africa and from Ireland to the Ural Mountains and the Caspian sea. Since the late 19th century, the species has been widely introduced beyond this range by man. There is only one true native trout species in the British Isles: Salmo trutta. Rainbow trout are natives of North America and were been introduced to the UK in the 19th century. A study in America suggested that the catch rate of trophy-sized trout (longer than 38 cm) was 28 times greater in the catch-and-release area than in a harvest (catch and kill) area. Barriers like weirs, culverts and hatches can prevent resident brown trout from accessing spawning areas and habitat vital to all other stages of their lifecycle. Brown trout caught on fly are less likely to die after release than trout caught on bait. Calcium carbonate precipitation is a phenomenon that occurs in chalk streams and causes the river bed to become cemented by deposits of calcium carbonate or 'tufa'. This causes spawning gravels to concrete over and prevents fish from digging reds. 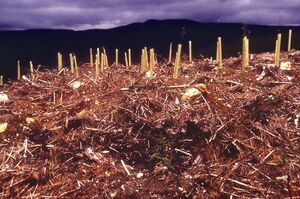 This problem is caused by low and slow river flows and increased inputs of nitrogen. Catch and release is an important management tool that prevents over exploitation of fragile wild brown trout fisheries. ’’...a good game fish is too valuable to be caught only once.’’ – Lee Wulf. Conifers can capture acidic emissions on their needles, rain washes this off and the acidified water then acts on the soil to release heavy metal ions poisonous to salmonids through uptake via their gills. Excessive angling pressure can reduce the abundance of trout populations by selectively removing large, reproductively active specimens from the population. Experimental studies of stocked and wild brown trout in natural conditions demonstrate that farm reared fish have poor survival and reproduction compared to wild fish (often less than 10%). Farmed trout are selectively bred for different characteristics to wild fish: for example, they spawn earlier and put on weight faster. Farmed trout are heavily domesticated, one result being that they have a reduced reaction to predation, making them more vulnerable than wild fish to predators (including anglers!). Hybrid wild/farmed fish are weaker than their wild counterparts, thus stocking can, over time, reduce the health, reproductive potential and ultimately numbers of trout in a river system. Introduced organisms can adversely impact wild trout, For example in Canada & New Zealand, a non-native alga Didymosphenia geminata - common name rock snot (due to appearance) , has resulted in reduced circulation of water amongst the substrate of the river bed in affected areas which in turns reduces the number of trout eggs which survive to hatch. Juvenile trout survival and abundance in southern chalk streams is strongly correlated to river flow in the preceding April (Solomon and Paterson,1980), which suggests that April flow is critical for trout production and requires protection. Many strains of domesticated trout have been in captivity for 30+ generations. Overgrazing by livestock has long been considered damaging to wild salmonid populations as it can remove river bank plant cover and in certain cases accelerate bank erosion leading to wider and shallower river channels with decreased current speeds and increased sediment loads. However, controlled livestock grazing might be really good for promoting biodiversity along a river and controlling invasive plant species such as Himalayan balsam. Sea trout conservation is affected by what goes on at sea as well as in spawning tributaries. The overfishing of sand eels in the North Sea is likely to affect the numbers of sea trout returning to their home rivers. 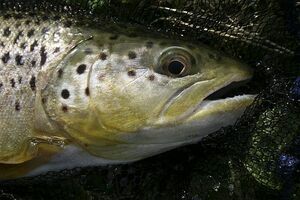 Stocked brown trout are blamed for threatening the genetic integrity of both Balkan and Mediterranean native trout strains. 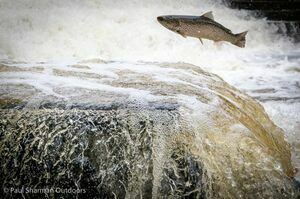 Studies in Europe have demonstrated that on small watercourses, hydropower schemes can devastate wild trout populations. Studies of trout populations in Europe and N. America show that stocking can lead to the loss of natural genetic diversity, potentially affecting their ability to adapt and survive in the future. The Balkans in Europe is a centre of endemism (uniqueness) for brown trout. In this region, four sub-species, distinct in both appearance and habits can be found; these onlude the Ohrid Trout, Marble Trout, Softmouth Trout and Dentex Trout. The more fish that are stocked into a water body, the slower they will grow in the wild. The simplest way to tell a farmed fish from a wild fish is to look at the condition of their fins. Many stocked fish suffer from damage to their fins (often healed, leaving them kinked or rounded). However, wild fish can also suffer from abraded fins and tails after spawning. Trout and salmon are especially vulnerable to climate change and global warming because they are dependent on an abundance of clear, cold water. As coldwater habitats warm, rising temperatures will have negative impacts on a variety of life history phases—from eggs to juveniles to adults (Trout Unlimited, 2012). Using barbless hooks can reduce the time taken to remove a hook and therefore damage to the fishes mouth. Brown trout tend to grow most quickly in the productive rivers and streams towards the south of the British Isles. For example, a three-year old fish in a Hampshire chalkstream could be more than 12" long. A three-year old trout in an acidic stream in the Highlands might be less than 6" long. Growth rate and river / lake productivity does not necessarily dictate how large a trout will grow. Ferox are the largest trout in the British Isles, and often inhabit lakes with poor productivity. In these conditions they live much longer than other trout and attain weights of over 31lbs by feeding on a high protein diet of other fish. Growth rates of brown trout vary enormously in different types of river and lake. The main distinction is between base rich/calcium rich rivers (chalk streams and limestone based rivers) where food is abundant and trout grow rapidly, and the acidic rivers which are less productive and trout grown more slowly, or become sea trout. Heavy sediment loads in spawning gravels of southern chalkstreams have been shown to kill all deposited trout eggs. 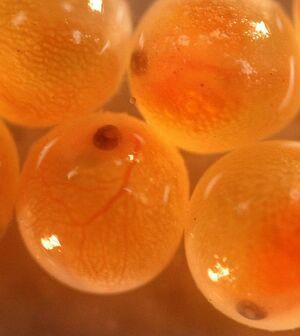 However any eggs that do hatch produce young that grow quickly and have a better than average survival rate. In rivers, trout are territorial and will often chase away other trout from their feeding lies and bolt holes. In lakes, where there is no localised "preferred area" to defend, trout are less aggressive.